In the 23rd meeting held on the 10th November, 2017, the GST Council had recommended major relief in GST rates on certain goods. These rate changes have been brought into effect from the 15th November, 2017. On 178 items the GST rate has been brought down from 28% to 18%. With reduction of rate coming into effect, a consumer shall be charged the revised reduced rates of 18% on these items with effect from the 15th November, 2017. Accordingly, there would be a corresponding reduction in price/MRP on these goods. Consumers may take note of these reduction while making purchases. 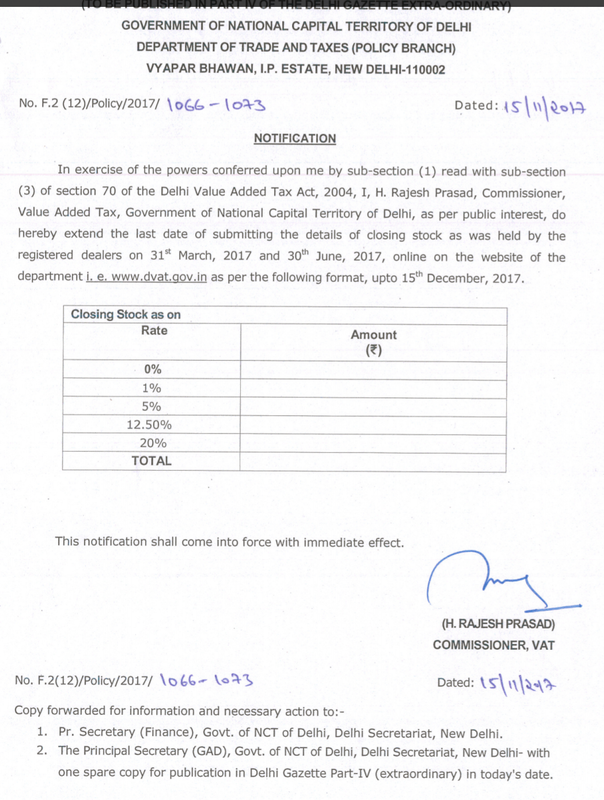 Commissioner DVAT has extended the date of online filing of Rate wise Closing Stock details as on 31/3/17 & 30/6/17 upto 15/12/2017. *The system envisages allocation of a particular taxpayer's profile to any officer across the country via a special software. * In the existing system, taxpayers are assessed in the specific region where they are based. The move aims to curb corruption in the department along with harassment faced by the assessees. "This is a first-of-its-kind initiative. Under this, *neither the assessee nor the tax officer would know the other's identity,*" said a senior I-T official close to the development. The system is expected to dissolve the main 18 tax regions in the country, which account for all direct tax collection. Recently, Prime Minister Narendra Modi highlighted several defects in existing tax laws and directed the I-T department to build a new system for taxpayers. *In the new system, if the tax department launches scrutiny against a person in Delhi, the software will provide the related correspondence and generate a unique identification number. This number, or code, would be randomly assigned to an assessing officer (AO) based in say, Mumbai or Guwahati or anywhere else. The AO will not be able to identify the person against whom the scrutiny has been launched. * The investigation will be pursued based on the case details and the relevant documents pertaining to the matter. The new system would also do away with the AOs' discretionary powers to call for additional documents, records, and most importantly, ask the taxpayer to appear in person. Under the pilot project, the additional documents, if required, will be sought through the system, which will automatically send a request to the assessee for submission of the same. The jurisdiction-free assessment system aims to minimise interaction between the taxpayer and the tax officer, ensuring a transparent and no-harassment culture. "The e-communication is expected increase voluntarily participation, and give more comfort to the assessee," added the officer. The first experiment would be done on scrutiny cases through an 'e-proceeding' system — an internet-based paperless communication system for tax dealings. 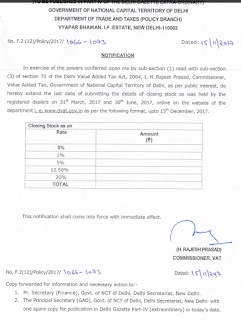 The I-T department is working on similar modules. Justices S Muralidhar and Prathba M Singh have granted an interim relief to the petitioners to import goods without payment of Integrated Goods and Services Tax (IGST) to the extent of advance authorization scrip obtained by them prior to July 1st. The order would be a major relief to the exporters who are under a threat of losing working capital on a daily basis due to the payment of IGST post implementation of the Goods and Services Tax (GST). The petitioner, in the instant case was granted with Advance Authorization as per the Foreign Trade Policy 2015 – 2020.In terms with the FTP, the Advance Authorization licence is issued to a manufacturer exporter or merchant exporter having past export performance in at least two preceding financial years. The petitioners were aggrieved with the Notification No. 26/2017-Customs dated 29th June 2017, issued by the Government post GST regime, wherein an additional levy of IGST was made for imports made after 1 st July 2017. The grievance of the Petitioner is that it holds export orders placed on it prior to 1st July 2017 for the fulfilment of which it has to undertake imports of inputs. According to them, with the change brought about by the GST regime, the Petitioner would have no option but to pay IGST out of its sources causing a working capital blockage. The Petitioner would have to rely upon borrowings as it has already exhausted its overdraft limits with the banks. The prospect of the IGST being ultimately refunded some time in future is of little consolation to the Petitioner who seeks liquidity to discharge the additional levy of IGST failing which its imports will get blocked. It is in this factual background, the petitioners impugned the applicability of levy of IGST even to imports that are made for fulfilment of export orders that have been placed on and accepted by the Petitioner prior to 1st July, 2017. Also, the Petitioner is seeking to only avail the credit outstanding in respect of advance authorizations issued to the Petitioner prior to 1st July 2017. The Court, being satisfied that there is prima facie case in the petitioners case, directed the Government to allow the Petitioner to continue making the imports under the Advance Authorization licenses issued prior to 1st July, 2017 in terms of their quantity and value subject to terms. Accordingly, it made the following directions. The Petitioner will be permitted to clear the consignments of imports constituting inputs for the fulfilment of its export orders placed on it prior to 1st July 2017 without any additional levies, and subject to the quantity and value as specified in the advance authorization licenses issued to it prior to 1st July 2017. (b) ensuring that the extent of credit is available vis-a-vis such Advance Authorization licenses issued prior to 1st July 2017. The above interim direction is further subject to the Petitioner furnishing an undertaking by way of an affidavit filed in this Court within one week from today to the effect that in the case of the Petitioner ultimately not succeeding in this writ petition, or failing to fulfil its export obligations, it is liable to pay the entire IGST as was leviable, together with whatever interest as the Court may determine at the time of final disposal of the writ petition. The Petitioner will furnish to the Customs Department the entire list of its Advance Authorizations that are valid as on 1st July 2017 and a list of the export orders placed on the Petitioner prior to 1st July 2017. It is made clear that the above interim direction will only apply to those imports which are made by the Petitioner for fulfilment of its export orders placed with it prior to 1st July 2017 and not to any export order thereafter. You are advised to take necessary action for timely compliance and avoid applicable penalties. GIC decides to extend Date of GSTR 1, GSTR 2 and GSTR 3 for the month of July to 10th, 25th and 30th September 2017 respectively.